We’ve also listed some additional resources at the end of the article. Important! Sync is not meant to be used as a data backup service. If the data is not stored locally on any devices, we can’t guarantee you’ll be able to restore the data on a later date. To use Sync, you need to have a Vivaldi.net account. Click on the cloud icon on the left side of the Status Bar next to the Panel toggle or open Settings > Sync. First, log in to your Vivaldi account with your account’s username (email address is currently not accepted) and login password. Your login password is sent to our servers over a secure connection and a hash of it is stored in our database. You also need to pick an encryption password that is used for encrypting your data. Your encryption password is used locally on your computer for encrypting the data you are about to send to our servers and to decrypt the received data. Your encryption password is never sent to us or any other third party, which ensures that we cannot decrypt your data. If you don’t use an encryption password, your Vivaldi.net account’s password will be used, but this is strongly discouraged because it means you are encrypting with a password you are also occasionally sending over the Internet and is thus more vulnerable to attacks. To sync User Profile data across devices, currently, a separate Vivaldi account is needed for each profile. The data you send us is encrypted on your computer using a password that is never sent to us. In addition, the servers on which your encrypted data is stored are well protected from intrusion both physically and from the network. When syncing, the encrypted data is sent to a central server, from which it can be requested from all other Vivaldi instances only by the same user. When one Vivaldi instance sends new data to the Sync server, a notification is immediately sent to all other Vivaldi instances to let them know that they can download this new information. This means you should see changes reflected within a minute. Vivaldi stores Sync data on its own servers in Iceland. 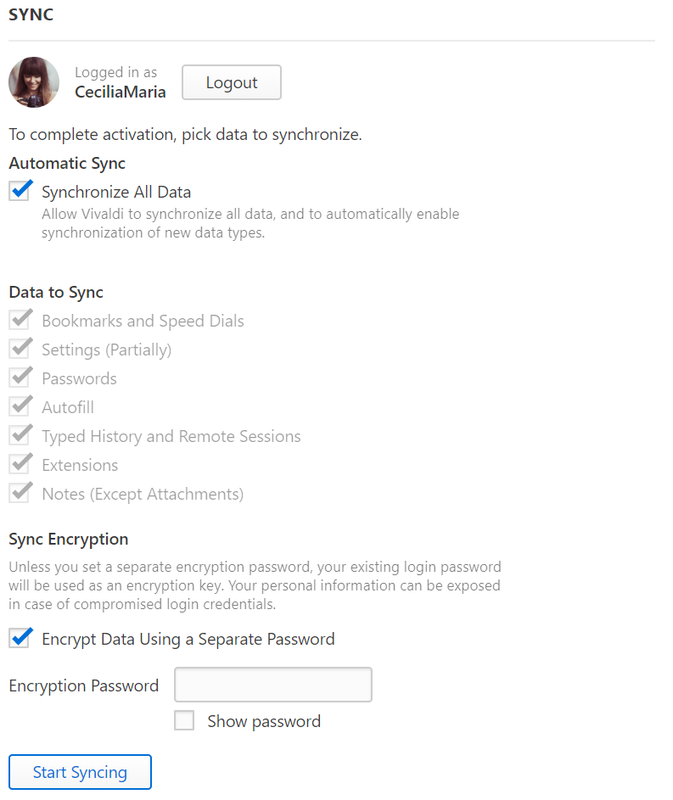 If you want to know more about how we handle your synced data please visit Sync’s Privacy Page. Most data, like Bookmarks and Notes, will be put to the respective locations, but to access the tabs that you have open in another Vivaldi instance, look for the Cloud icon, but this time on the Tab Bar, next to the recently closed tabs (Trash Can) icon. When you log in or enable synchronization of some data type, your local data is merged and reassociated with what exists on the server. This is done in a way that ensures you won’t lose any data. Some things like Bookmarks can be moved to match the location the server believes they are in. When you choose to stop syncing some types of data, the browser forgets all association between your local data and the data located on the Sync server. All your data remains on the Sync server as it was. When you explicitly log out from Sync, the same happens for all the synced data. Please note that quitting the browser does not log you out from Sync. Click on Clear Data on Server. If, in addition to clearing the data and logging out of Sync, you’re also thinking of deleting your Vivaldi account, please note that when the account is deleted, you’ll also lose access to all other Vivaldi Community services such as webmail, forum, and blogs. If you still wish to proceed, follow the instructions on our help page. If you wish to change your login password, log in on Vivaldi.net, go to your profile (top right corner) and change it there. In case you’ve forgotten your password, send yourself a password reset email. Note that if you have chosen to use the same password for login and encryption, changing your login password will not automatically change your encryption password and you will have to do this separately. “Start Sync” and re-enter a new password. Your data will be deleted from Vivaldi’s Sync servers and re-uploaded from the computer you’re using once you enter a new password. You can also read about our journey to release Sync on the Team blog: Sync hits Vivaldi Stable, Sync is here, help us test it and Sync: Status update. The forum is a great place for getting answers to your questions. You can also contact us describing the issue in as much detail as possible.